It almost goes without saying that the Government itself, and individual civil servants, must take particular care to obey the law. After all, if the law makers and their servants will not respect the law, why should anyone else? It follows that it is a very serious matter for an individual civil servant to be dishonest, whether in their private or public life. It is equally important that we apply the utmost good faith in our official dealings with the judicial machine. If we become involved in a legal dispute, we have a duty to assist the court by drawing all appropriate facts, documents and arguments to its attention. There can be no question of hiding or distorting evidence so as to improve the chances of ‘success’, even if it is felt that such tactics are being deployed by the other side. 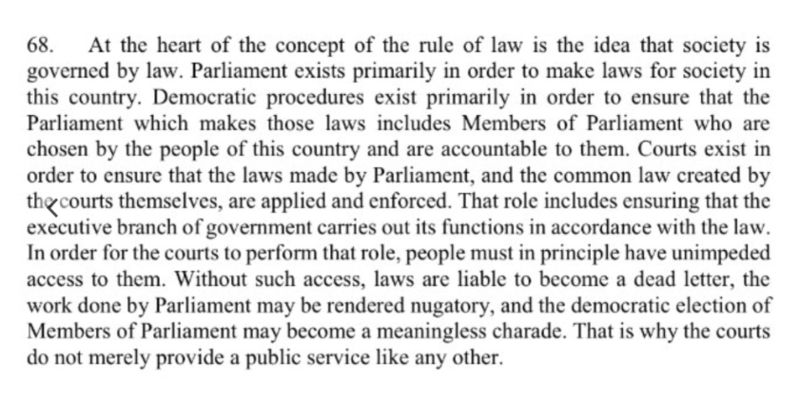 This is a very dynamic part of the law, and decisions are greatly influenced by the judge’s perception of whether the powerful have acted fairly (a very subjective concept) in all the circumstances. It is in particular strongly influenced by human rights considerations. Every civil servant should therefore read The Judge Over Your Shoulder. And you should also consult a lawyer before you, or your Minister, makes any decision which might conceivably be challenged as being in some way unfair. The common law of judicial review in England and Wales has not stood still in recent years. 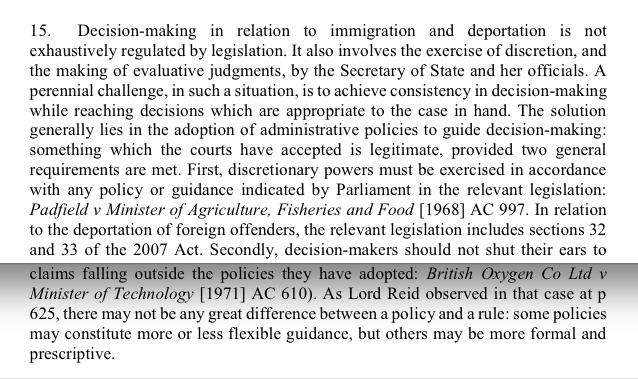 Starting from the received checklist of justiciable errors set out by Lord Diplock in the CCSU case, the courts ... have developed an issue-sensitive scale of intervention to enable them to perform their constitutional function in an increasingly complex polity. They continue to abstain from merits review – in effect, retaking the decision on the facts – but in appropriate classes of case they will today look very closely at the process by which facts have been ascertained and at the logic of the inferences drawn from them. The common law no longer insists on the uniform application of the rigid test of irrationality once thought applicable under the so-called Wednesbury principle. The nature of judicial review in every case depends upon the context. … “the court must ... be entitled to subject an administrative decision to the more rigorous examination, to ensure that it is in no way flawed, according to the gravity of the issue which the decision determines". A further factor relevant to the intensity of review is whether the issue before the Tribunal is one properly within the province of the court. As has often been said, judges are not ‘equipped by training or experience or furnished with the requisite knowledge or advice’ to decide issues depending on administrative or political judgment.... On the other hand where the question is the fairness of a procedure adopted by a decision-maker, the court has been more willing to intervene: such questions are to be answered not by reference to Wednesbury unreasonableness, but “in accordance with the principles of fair procedure which have been developed over the years and of which the courts are the author and sole judge”. 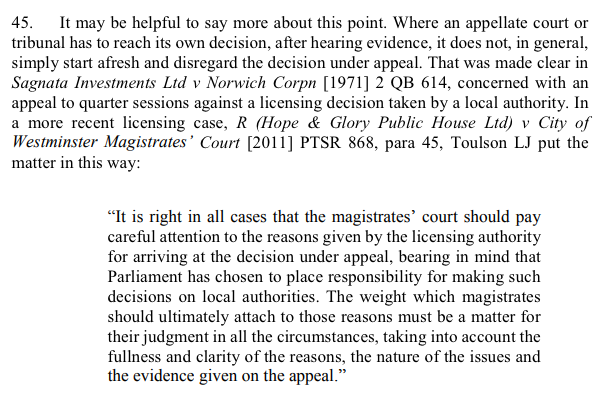 The Wednesbury test, by the way, requires the Courts to intervene ‘if no reasonable Minister properly directing himself could have reached the impugned decision’. As noted above, this appears to be a stiff test, but decisions are in practice quashed more often than you would expect. So it is well worth stopping and considering whether your actions will appear fair and reasonable to a dispassionate observer well after the event. And even if JR were ‘merely’ all about process, it is nevertheless true that good process will greatly increase the chances of your making a good decision, so JR has value if it persuades you not to cut corners. In addition, however, JR may be brought if there is any appearance of bias, or going beyond Parliamentary authority. A The first are those factors that are specified, in the appropriate legislation, as relevant to the decision. The decision has to be consistent with those factors. In other words, it should be possible to imagine a reasonable person taking a similar decision on the basis of the same facts, without taking into account other factors. B Ministers may also take other relevant factors into account, such as the economic needs of a particular region, or the need to be seen to be encouraging competition. C But Ministers may not take into account irrelevant factors such as the regional political situation, or recent political donations from the company in question. The borderline between the categories can sometimes be indistinct. Legal advice should therefore be taken if you are in any doubt.